Dulce Duca. Desperately, or not? Severine speaks philosophical lyrics. On her hands, with balloons to her toes. Dulce Duca plays with seduction and abandonment. Both women show a fresh perspective on the public space as a playground and have been selected for Spoffin LAB 2018.
International street arts Festival Spoffin in Amersfoort is one of the few Dutch festivals for outdoor theatre with a residency. With Spoffin LAB, the festival stimulates the development of new productions for the public space. The selected theatre makers will work independently on a new performance prior to the festival, which will premiere during Spoffin 2018. 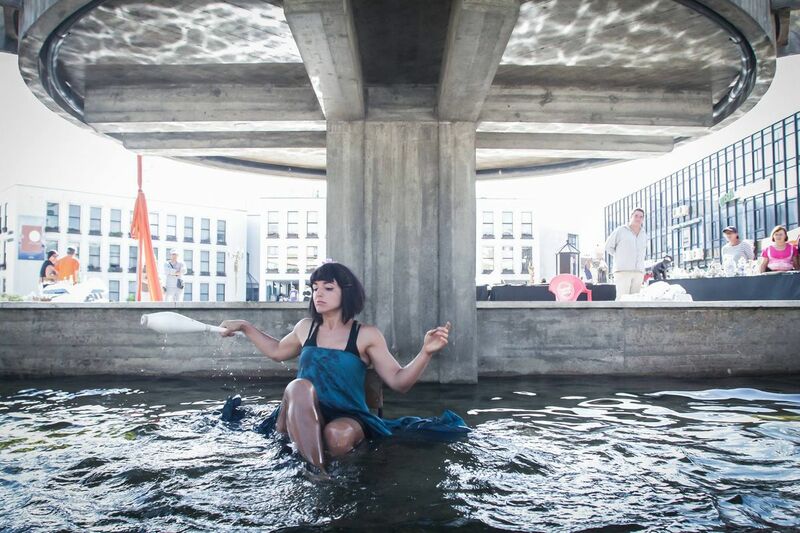 "Severine de Maleingreau seeks forcefully commitment with the city and uses it as a backdrop for her project," Alfred Konijnenbelt, artistic director of Spoffin says. The Irish circus artist, teacher and performer is most happy when she stands on her hands. She allready developed a small solo performance in which she turns up everywhere in the city, upside down with three balloons tied to her big toe, speaking philosophical texts. Under her stage name Sevesfeathers she will come to Amersfoort in August to work with two other artists on a new and larger project. Here too, they will pop up to cheer up the city with unexpected, colourful images. Her residency is meant for further development of the project and to try out at all kinds of locations. The Spanish Dulce Duca is more experienced and a real performer. She likes to keep eye contact with the audience and uses all her femininity, playing with seduction and abandonment. Does she really grieve for the man who left her in front of the altar? Or does she enjoy her regained freedom... Circus, live music, projection: she uses everything she can. Spoffin LAB is intended for young upcoming talent and also for more experienced theatre makers who want to try something new. This year the festival was able to choose from 20 different projects of groups and artists from Denmark, Spain, France, Italy, Great Britain, Ireland and Ukraine who applied for the residency. The ninth edition of Spoffin takes place from 23 to 26 August in Amersfoort (NL). Sevesfeathers (IE) and Dulce Duca (ES / PT) will arrive ten days earlier. The festival provides living and work space, supports in generating publicity and finding suitable venues.